I have 6 kids, so it should come as no surprise to you that I’ve done a lot of my homeschooling with little people under foot. You might be wondering if it is actually possible to homeschool with little ones. Well, I’m living proof that it is actually possible. I’m still alive. My little people are still alive. Education happened despite the chaos. So, know that you too can do this. But I’m here to share a few helpful tips with you in case you’re feeling a little overwhelmed by the task. It’s ok to throw the traditional school schedule right out the window. You are in survival mode right now! Just school whenever that little person is asleep. 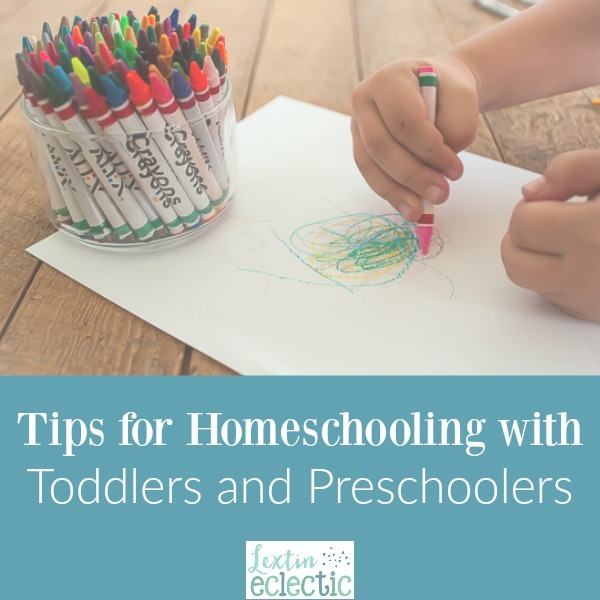 Have all your supplies gathered and ready and as soon as those eyelids are closed, sprint to your homeschool space and get busy! Now, if your little person is an irrationally early riser, this might not work for you. I’ve been blessed with kids who sleep until 7:30 or 8, so I take advantage of the early morning hours. Yes, this means that I get up early and I wake my older kids so we can do at least an hour of school before the tiny person is awake. It is SO much easier to teach fractions or sentence diagramming without 100 interruptions. Schedule the first half hour of your school time as “totschool” or preschool. Have planned activities for your little person – a sensory bin, a special workbook, or even an educational game. Set your timer and spend uninterrupted time with your youngest. (Bonus tip – have your older ones do some chores during this time). Then once the timer beeps, your little one can have some play time while you work with an older child. They are less likely to interrupt and cause total chaos if they’ve had some time spent with you first. Have activities planned for your youngest child. Create sensory bins, buy special workbooks or coloring books, and plan some theme-based activities just for them. Little ones sometimes like to have their own “school” that is especially prepared for them. You can often keep them entertained close by you with sticker books, math manipulatives, and printable preschool activities. Plan ahead and have a long list of ideas for your year and prepare them in advance. If you have older children, create a schedule where they take turns entertaining the youngest child. Let them be the teacher and direct the preschool activities or give them a special game or activity they can do with their sibling. Over time they will become great babysitters and if this activity is planned into your day, it will become routine and your little one will come to except this special playtime. Purchase some special toys that will only be used during school time and store them in tubs or totes on a high shelf. Bring them down only during school time. And rotate which toys are brought out each week. This ensures that your little one has new-to-them toys to keep them entertained. A routine is so important to your homeschool day! It’s so much easier when everyone knows what to expect. If your little one knows that he will have time with you right after breakfast and then will have play time before having circle time with everyone, your day will flow much more smoothly. You won’t have to remind and redirect quite as often. Over time the routine will become a habit and your child will be able to anticipate what comes next during the day. Baby gates are your very best friend during these crazy years. Use them to gate your toddler into a room or to keep them out. Gate them into a room with a sibling for playtime and set the timer. When it beeps, move your toddler into a different room with a different sibling. Knowing that your toddler is in a safe room gives you a little bit of time to do some school work without worry. Yes, that room will be a disaster, but your tiny person will be safe and that’s more important than a clean house. I am not afraid to admit that I often use snacks as bribery to help us survive a homeschool day. I have snack time planned once in the morning and once in the afternoon. I let my little one sit in a safe chair nearby while she munches on snacks and I keep right on working with one of my older children. Snacks can buy you several precious minutes of quiet. Have a collection of healthy snacks that are already prepped and ready for each week. Even if you’ve planned and prepared for each week, you’ll still have disasters and chaos. It’s just part of the reality of homeschooling with little ones. However, if you are proactive, you’ll be able to accomplish school, spend some quality time with your little ones, and survive to homeschool another year. I’ve got faith in you homeschool mama! Homeschooling is hard but you’re doing a great job! And be watching for my post next week! I’ll be sharing some of my favorite ideas and activities for little ones. I hope it goes well this year! It is definitely hard to homeschool with littles! I have found it easiest to do most of our work while they are sleeping! One tip I have is I put my little one in his crib with some toys for some quiet play time. We have done this frequently with all our kids when they were little, so they are used to it, and don’t view it as a punishment. He will quietly play for about 30 minutes. I make sure to take him out before he does start to complain. I second baby gates! I also utilize those to help keep my LO contained to the playroom and dinette (where we do school). At least I know where he is while teaching the older children! Baby gates are the best! I have also used the pack and play nearby to let my little one play safely while staying contained. It is so hard to keep track of everyone during the school day and I’ve found these tips so helpful!